Where on Earth? by David H. Minton is currently on tour with Bewitching Book Tours. The tour stops here today for a guest post by the author, an excerpt, and a giveaway. Please be sure to visit the other tour stops as well. Sparks fly between Dan and Samantha as they find themselves running for their lives - from the good guys as well as the bad guys out to ruin the things they long to protect. Will they be able to escape before it’s too late? Will they get a chance at love or will they lose everything ... including their lives? As the flight got underway, Samantha, having never experienced a helicopter ride before, saw that the view below her was quite different, in an intimate way, than the view from a passenger - plane window. She looked all around below and was amazed by the closeness and the individual features of the view. She now understood why it was sometimes called a ‘God’s eye view.’ Like God, one could stop and hover over one place, examining as long as needed. When she looked down on a scene from the chopper, it looked like what she imagined God might see if he looked down from heaven. The amount of detail she could see was amazing. She began to study the terrain, looking for anything familiar. Her reasoning was that one of the most important things in her life had happened not far from here, so she should at least be able to recognize major landmarks. It wasn’t to be, however, and she was entirely surprised when she heard Dan announce in her ear they had arrived and he would be putting the bird down. They would wait until the police caught up, in about five minutes. By this time, they were sitting on the ground, waiting. At first Samantha didn’t recognize anything, but then as she scanned the scene, she realized her team was congregated off to the side and they were furiously active, barking and running. Suddenly, Dan leaped out of the cockpit and began running toward her dogs with a powerful - looking rifle. When he started firing at the dogs, the noise blasted in her ears, and she was sure it was powerful. Frantically, she undid her seatbelt and moved to the door, trying to figure out how to open it and get out. By the time she had figured this out and had landed in a foot of snow, the police department chopper had arrived. The Police Chief jumped out and began clambering through the snow after Dan, carrying a shotgun - and also shooting at her dogs. She bounded into the path Dan had cut and furiously followed the two men, yelling loudly at them as she went. Etoile ran beside her, undeterred by the fluffy snow that threatened to bury her with each step, even using Dan’s tracks. Did the Development of the Story come from Real Life Experience? Many of the events Dan experienced, or very similar events, did happen to me in real life, although not in one single adventure. As for Samantha, to the extent I was capable, I tried to model her after my Susann, who has a degree in English Literature but is also an engineer in her own right, having graduated from Berkeley with a CSEE degree. She protested the war in Viet-Nam while I was fighting it. This is how we spent our third year of marriage. It never could have worked if we did not learn to pay attention to and respect the other’s opinions. I tried to fit that spirit into the novel in showing the relation between Samantha and Dan as they worked out their lives and problems. After graduating college, David spent two tours in United States Military Assistance Command Republic of Viet-Nam, before beginning his career as a nuclear engineer, then electronics engineer, telecommunications engineer, and software security engineer. He has previously published three non-fiction books, several poems, and many non-fiction technical and historical articles. Enter the tour-wide giveaway for a chance to win one of five ebook copies of Where on Earth? by David H. Minton. 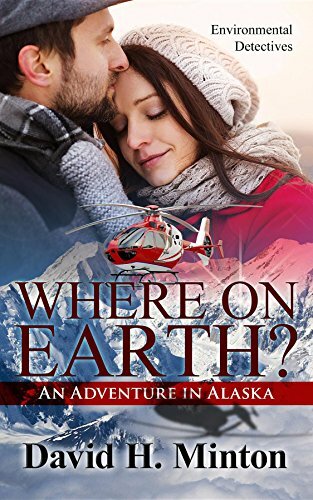 Labels: action, adventure, Alaska, Bewitching Book Tours, book tour, David H. Minton, excerpt, fiction, giveaway, guest post, new release, romance, Where On Earth?